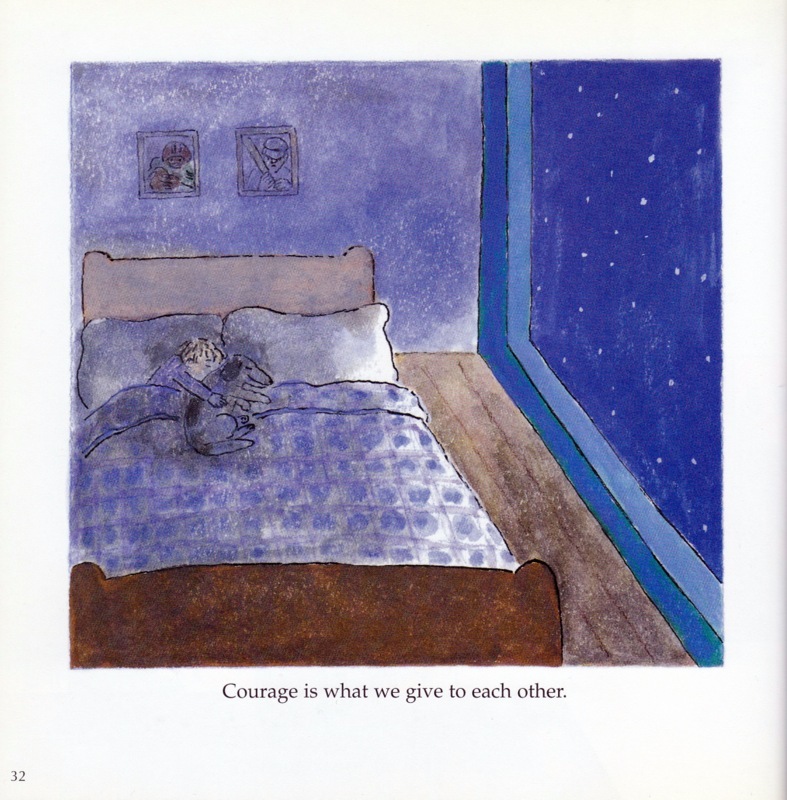 Courage by Bernard Waber: Sometimes even the smallest act requires bravery. Bernard Waber (1921-2013) wrote and illustrated over thirty books for children and is best known for his series of books featuring Lyle the Crocodile. The first book to introduce the world to the lovable and talented crocodile was The House on East 88th Street (1962). It tells the story of Primm family, who has just moved into their new home when they discover Lyle living in their bathtub. In no time at all, the talented and helpful Lyle is a loved and cherished member of the family! Several more books featuring Lyle followed. Waber’s straightforward and often humorous text coupled with his approachable and cheerful art results in entertaining stories with enormous appeal. Though his characters are rarely human, their troubles are familiar and are gratifyingly resolved in an encouraging manner. Waber departs from his customary animal characters in Courage; his quivery-lined, active art depicts human children carrying out every day acts of courage. It’s easy to spot courage in a firefighter or a police officer or an ordinary citizen performing a brave act, but sometimes very small endeavors also require boldness. The opening illustration features a female ice-skater executing a mid-air split. 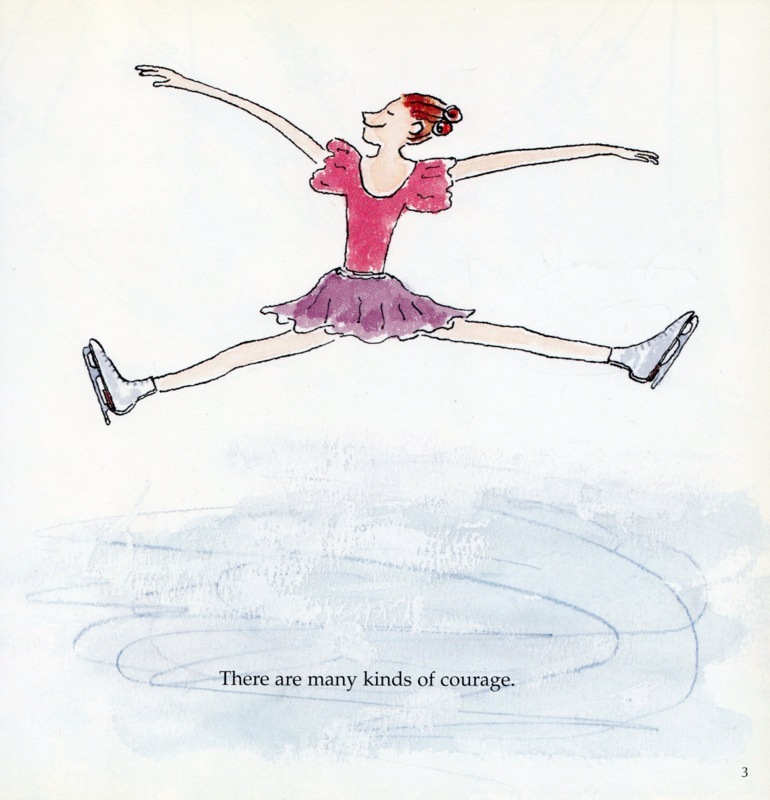 In the following pages, Waber expounds on the many varieties of courage; some are awesome, like performing in a trapeze act or climbing a mountain—others are small, such as having two candy bars and saving one for tomorrow. Courage is riding your bicycle for the first time, going to bed without a nightlight, jumping off the high dive, or getting a haircut. Courage can also be checking out the noises in the dark or keeping the secret you promised not to tell. Courage is telling the truth, exploring new places or holding onto your dream. 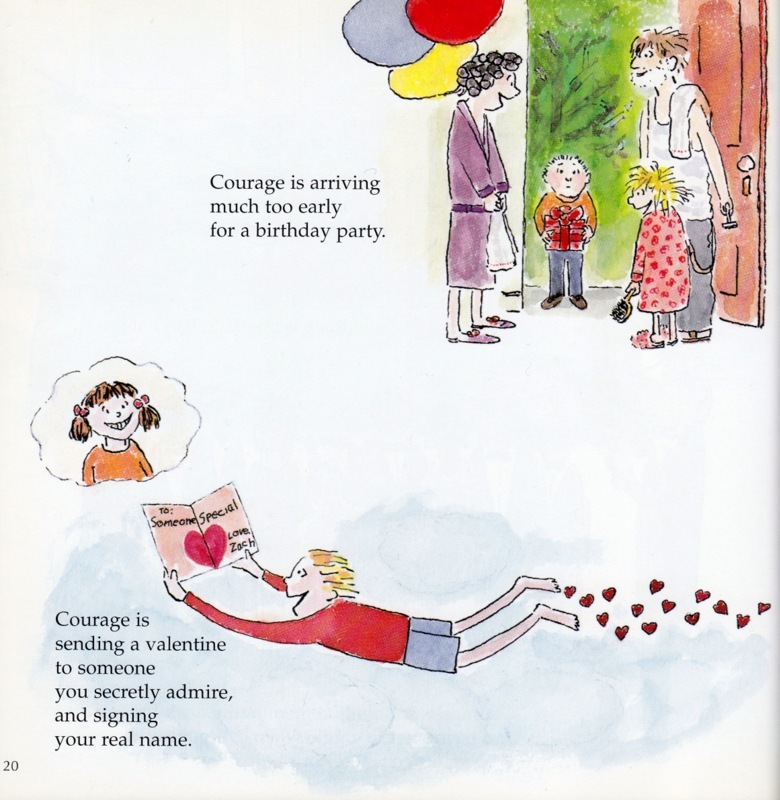 More a guide than a story, Courage offers parents an opportunity to teach their children an invaluable life lesson: experiencing fear is a universal trait and overcoming that fear, large or small, is an act of bravery. Furthermore, once we find that bravery within ourselves it can be shared with and fostered in those around us. 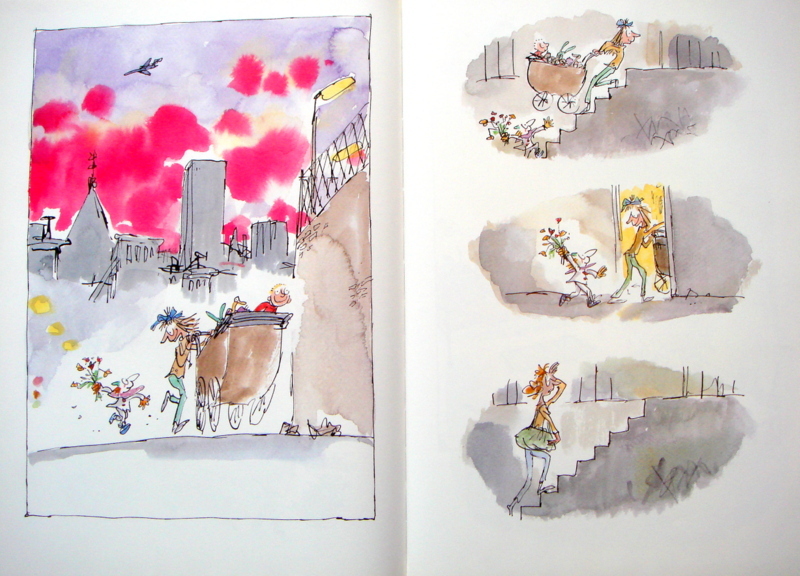 Clown by Quentin Blake: A wordless delight. 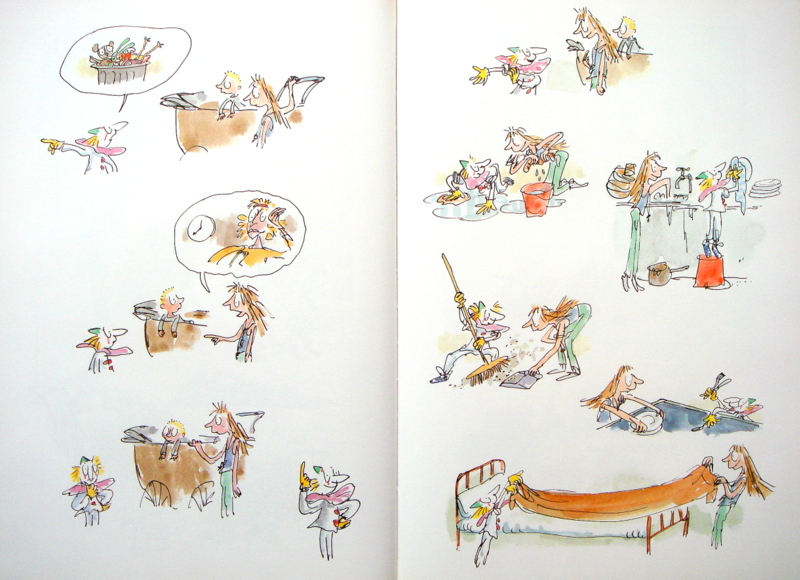 The work of Quentin Blake has appeared before on TurtleAndRobot.com, here and here. He is perhaps my most favorite illustrator. Fortunately for me, he is extremely prolific. Unfortunately for me, I may never be able to collect all his books. His skilled storytelling, expert lines, quirky style and exceptional art never cease to amaze me. 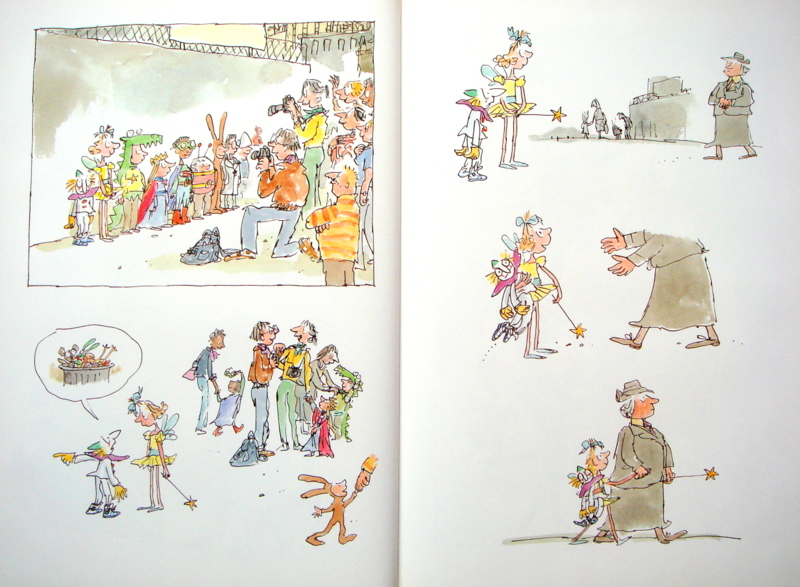 Clown, a wordless picture book, is among my favorite picture books ever. Blake’s generous palette is radiant and expansive. The story is sweet and sad; the art, as always, is active and expressive. Though this is his only wordless picture book to date, Blake’s art often needs no words; with a quick line and a splash of color he is able to convey more energy and emotion in one panel that some artists can achieve in an entire book. 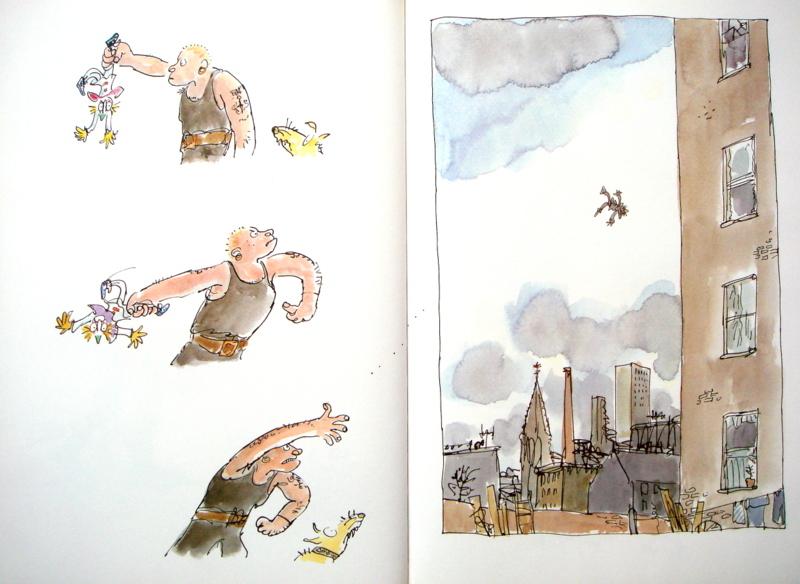 The small and elite group that I consider to be in the same realm of Blake’s artistic genius includes only two other illustrators: Shel Silverstein and Tomi Ungerer. Each of these men is able to breathe irrepressible life into a single line. Though the style may appear to be easy and uncomplicated it is in fact richly complex and expertly crafted. Wordless picture books can be off-putting to some adults—they panic, “What do I read if there are no words?” But a wordless book can be liberating. Readers have an opportunity to change the story every time they tell it. The story is right there in the pictures and how it’s told is up to the reader. Wordless books offer children and adults an opportunity to observe the action, follow a sequence of events and tell their own version of what they perceive. Wordless stories can aid in developing visual literacy, narrative skills and creativity. Freed from the confines of text, novel nuances emerge every time the book is opened. Clown opens with a grandmotherly figure descending the steps of a brownstone, her hands full of old, worn dolls. Into the garbage they go; the lifeless toys oblivious to their new unfortunate situation. In the next spread, a surprised Clown—who is amongst the recently discarded—looks around in dismay and quickly wriggles free. He drops to the ground and brushes himself off. Noticing his ragged shoes, the quick-thinking Clown roots through the neighboring pile of garbage and finds himself a sporty pair of high-top sneakers. The rejuvenated Clown is off and running! He soon spots a young child and rushes to tell her his story, but before he can finish she is scooped up by her parents and taken away. The baffled Clown is wondering what to do next when he’s picked up by an adult and promptly added to a group of costumed children being photographed. Clown, growing distressed, tells his story to a young girl dressed in a fairy costume. She happily picks Clown up and takes him with her. When she arrives at home her mother promptly throws the used toy out the window. Clown lands safely on the street and is immediately chased down by an angry dog. The situation seems dire but the ever-energetic Clown jumps onto a crate and puts on a show of acrobatics for the now bewildered dog. Just then, the dog’s owner comes along and Clown quickly finds himself being tossed aside again. He flies through the air and lands inside a home where a woeful caretaker is desperately trying to comfort a crying child. Clown’s unexpected appearance shocks them both. Without delay, the charming Clown begins entertaining his new audience. Swiftly relieved of their tears, the guardian and her charge are won over. Once again he explains his predicament. Clown and the caretaker quickly come to an agreement: he will help her clean up the house before the child’s mother arrives and she will help him rescue his friends from the garbage. The new friends work wonderfully together and the apartment is soon in perfect order. Clown, caretaker and baby head out to liberate the toys from their difficult situation. 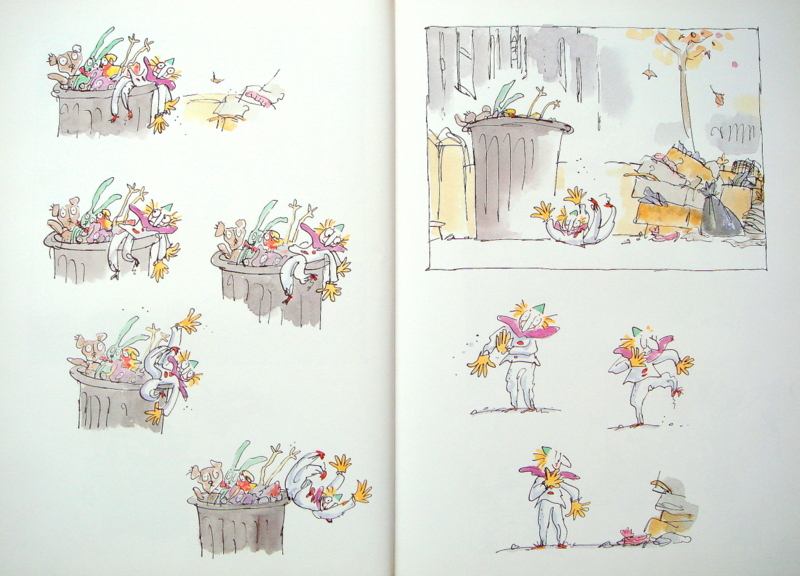 After retrieving his rejected comrades from the garbage, Clown finds a lovely blue ribbon for the babysitter’s hair and a bouquet of flowers to decorate the apartment; the jovial trio returns home. When the tired-looking mother arrives, she’s surprised and delighted to find a happy child, a clean home and a menagerie of new friends. Clown rests happily, his ordeals behind him, with his old friends and his new family. 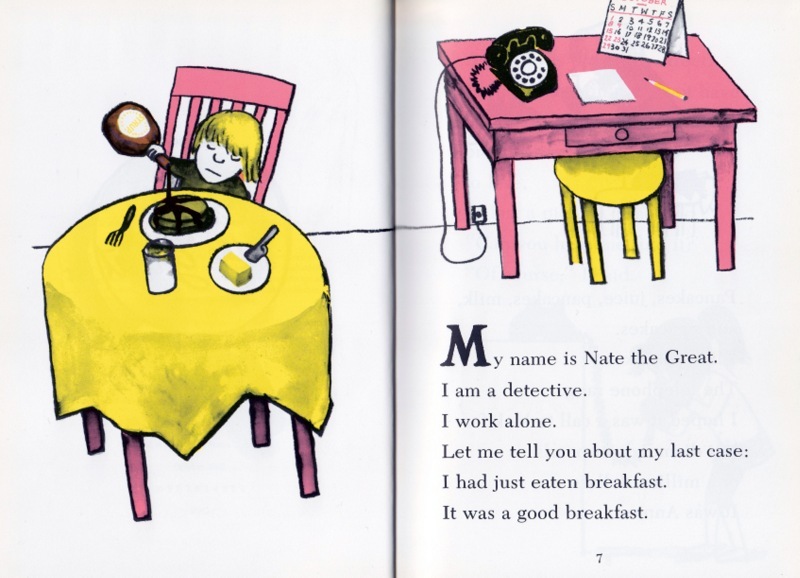 Nate the Great by Marjorie Weinman Sharmat: World’s best boy detective. Marjorie Weinman Sharmat has published over one hundred and thirty books, though her Nate the Great books, with twenty-six in the series, are the most well known. Her descriptive text and direct dialogue are peppered with a dry humor. With the exception of one single word—Nate sports rubbers, instead of boots, in the rain—this forty-year old story holds timeless appeal. This is the fifth book illustrated by Marc Simont to be reviewed in this blog. 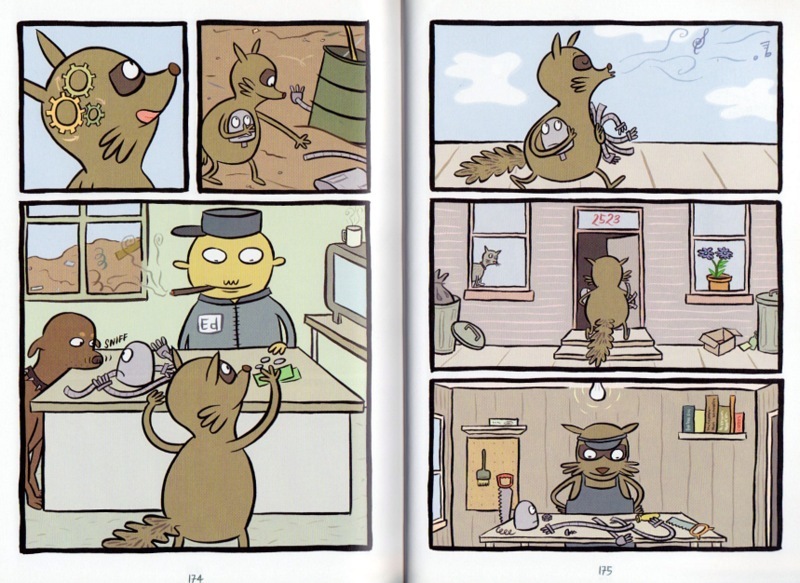 Like his art in A Tree is Nice, the spreads alternate between color and black and white. Simont uses vivid pinks and bold yellows in one spread and warm grays and lush blacks in the next. No matter the medium, Simont’s art is always expressive and energetic, pleasing and comfortable. Using classic hard-boiled detective language, Nate tells readers about his latest case: helping his friend Annie find a lost picture. He’d just finished a breakfast of pancakes (Nate loves pancakes) when she called and enlisted his help. 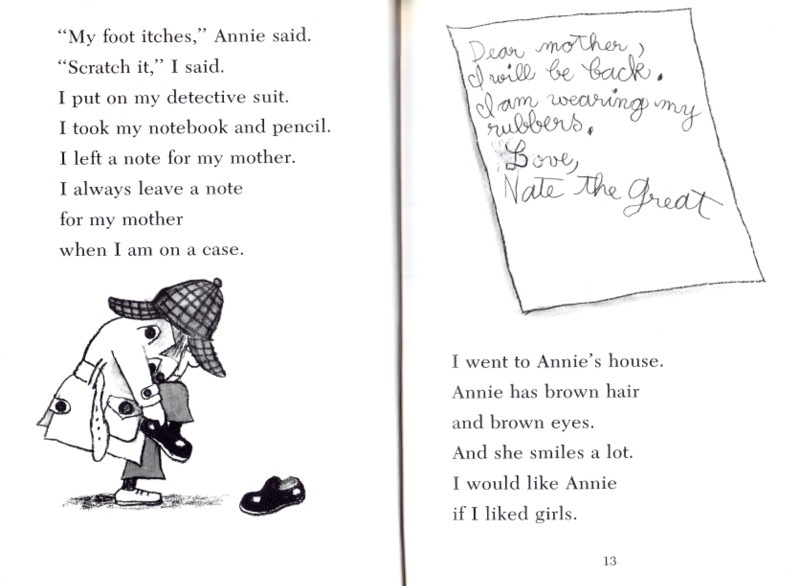 He donned his trench coat and Sherlock Holmes style hat and headed straight out to Annie’s, but not before leaving a note for his mother. When he arrived at Annie’s she was just sitting down to a pancake breakfast, so Nate joined her. They discussed the missing picture. Using bright yellow paint, Annie had painted a picture of her dog Fang the day before and left it out to dry, and then it was gone. After breakfast, Nate searched Annie’s room. 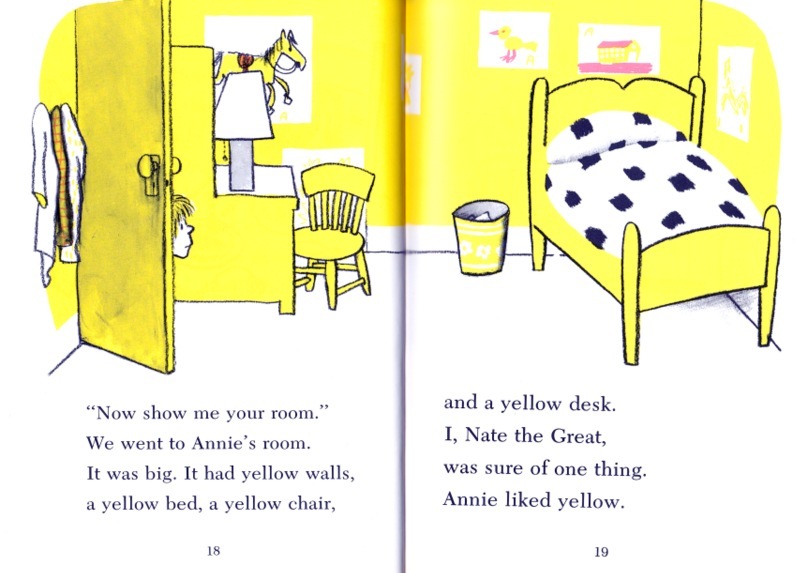 He was already sure of one thing, Annie liked yellow. He asked her who had seen the picture. Nate started with Fang. Fang was big, with big teeth. Nate watched him eat, then he watched him bury a bone. 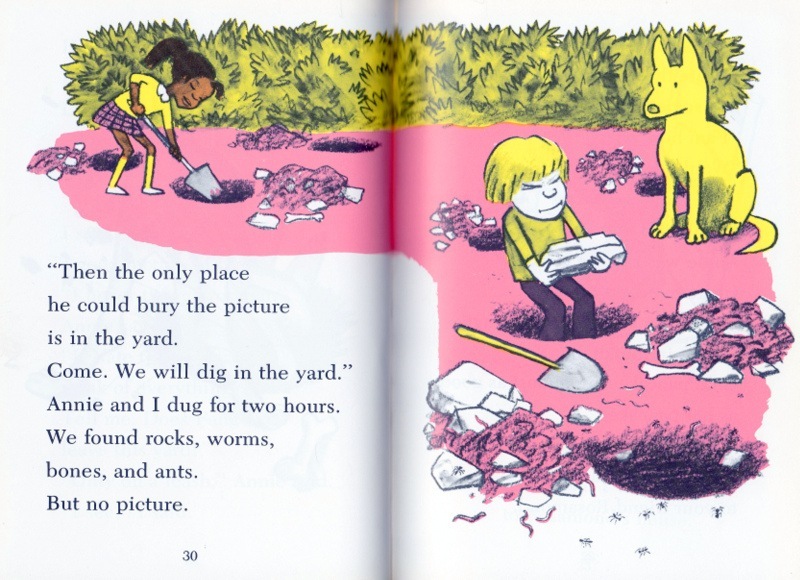 Nate had an idea that maybe Fang took the picture and buried it, but after two hours of digging in the backyard Nate and Annie only found rocks, worms, bones and ants. It was time for more pancakes. Nate and Annie when to Rosamond’s house next. Rosamond was dubious of Nate’s detective status so she asked him to solve a case of her own: find her missing cat, Super Hex. 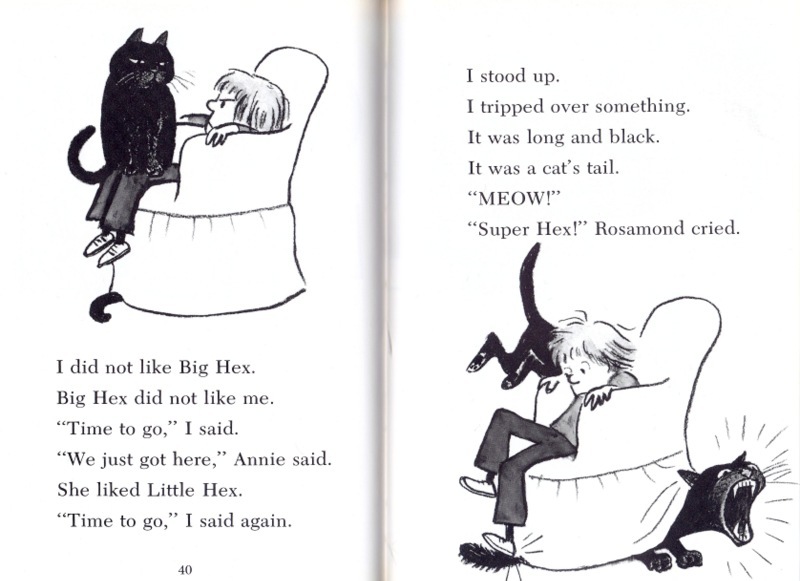 Rosamond had four cats, all named Hex, and a house full of cat paraphernalia. Nate sat down and Big Hex jumped onto his lap. Nate wanted to leave immediately; he stood up to go and stepped on something long and black. There was a loud meow. He’d stepped on the tail of Super Hex, who’d been hiding under the chair. The case inside a case had been solved. Nate and Annie left. Nate knew Rosamond did not take the picture, she clearly only liked cats. They headed back to Annie’s house to question to her brother Harry. 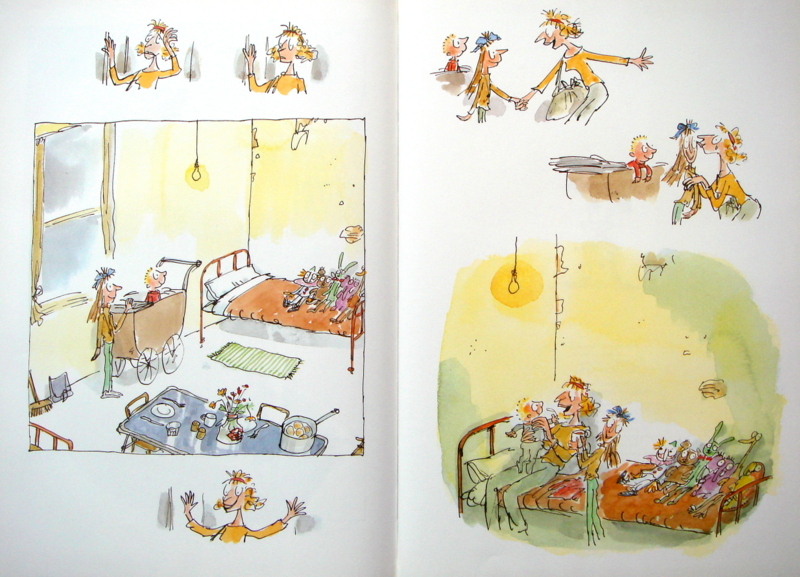 Like Annie, Harry liked to paint; the walls of his room were covered in his art. There was painting of a red house, one of a red clown, and one of a red tree. There was also a painting of a three-headed monster but that one was orange. Annie was confused; Nate explained. 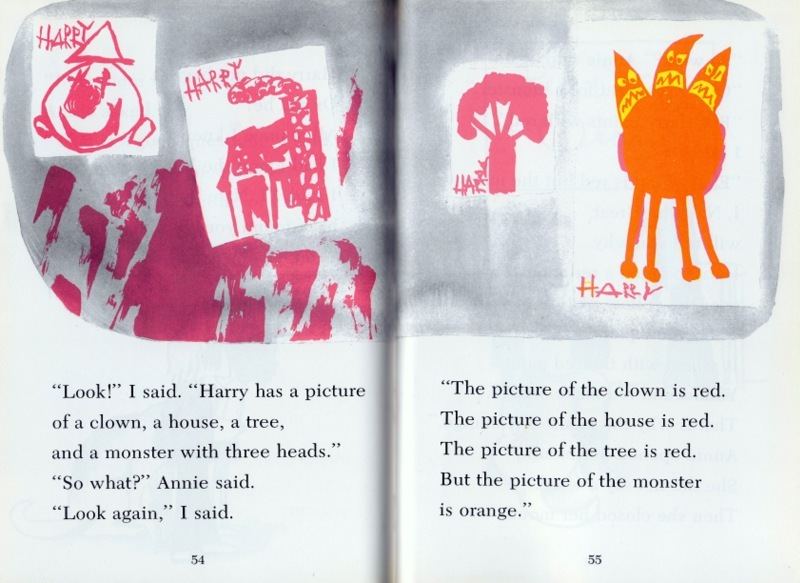 All of Harry’s paintings were done in red paint, except the monster. Annie’s picture of Fang was yellow. When you mix yellow and red you get orange. Harry had painted his red, three-headed monster over Annie’s yellow picture of Fang. The case was solved. Tangerine: A phenomenal book about finding the courage to stand up for yourself. Though I’m not a real-life sports follower, I love a good sports novel. The world and culture of sports provide fertile ground for rich storytelling. Tangerine, an outstanding piece of fiction, is one of my favorites. Edward Bloor’s writing is full and lively, and the narrator’s voice is authentic. Readers quickly come to understand the characters but may never stop questioning their behaviors—behaviors that may be familiar, yet foreign. The story unfolds via Paul Fisher’s journal entries. He and his family have just relocated from Texas to Tangerine, Florida. (Though there actually is a Tangerine, Florida, the city in the novel is fictitious.) Paul is about to start seventh grade at Lake Windsor Middle School. A star goalie at his last school, he’s hoping to make the soccer team here. He’s also legally blind, though he is able to see just fine with his (extremely thick) glasses. His older brother Erik tells people that Paul looked directly at a solar eclipse when he was five. Paul cannot remember the event but in the family photos prior to that summer, he’s never wearing glasses. Erik is a star football player and soon to be senior at Lake Windsor High. He treats his brother with disdain, takes pleasure in destruction, and has a clear and present violent streak. Their father seems only to focus on Erik’s sports ability and the “Erik Fisher Football Dream.” He pays far less attention to Paul’s playing, despite the fact that Paul is quite good. Paul lives in fear of Erik and has for as long as he can remember, but his parents seem to disregard Erik’s vicious bullying behaviors. In addition to placing a huge strain on the family, the recent move has also been triggering memories for Paul—memories of something that’s been hidden from him since the summer of the eclipse. Tangerine is a peculiar place. Among other oddities, like a perpetually burning muck fire at the edge of the Fisher’s brand new housing development, it’s also the lightning strike capital of the U.S. Every single day at roughly the same time, a powerful storm passes over the area bringing rain and lightning. Because of these storms, Paul’s school year begins rife with tragedies. Mike Costello, another senior and star football player at Lake Windsor High, is fatally struck by lightning. One moment he was standing with his hand on the goal post, in the next he was lying dead on the ground. Mike was the older brother of Paul’s friend, Joey, as well as Erik’s teammate. There’s an unsettling scene at the Fisher house where Erik openly mocks Joey for his reaction to his brother’s death. This is our first real glimpse into Erik’s sociopathic behaviors. During another daily storm, a massive sinkhole opens up near Paul’s school and swallows several of the classrooms. No one is seriously hurt but it will be months before the school can be fully repaired. When students are given the option of transferring to Tangerine Middle School, Paul happily accepts. After being placed on the soccer team at Lake Windsor, Paul was informed that he was not eligible because of an IEP his mother had filed with the school. His mother agrees not to inform the new school of his visual impairment, giving Paul a second chance at playing soccer this season. Transferring schools gives Paul a look into the other side of Tangerine, literally and figuratively. Lake Windsor High is comprised mostly of students from white, affluent families who are new to the area. The majority of Tangerine’s students are minorities, and many of them come from families who have been involved in the citrus industry for generations. While Tangerine has some star players of its own, the sports program at Lake Windsor High is much more highly regarded, so some of the more gifted athletes use fake addresses so that they may play for Lake Windsor instead. This is a recurring theme in the sports genre, as well as a reality of life. One school has the better sports program and is more highly visible, so students from a more impoverished area use a fake address in the better district to play sports there. This is sometimes done with the school and the coach fully aware, or even facilitating, the process. The student, ideally, gets a better education and the school gets a talented athlete. But these arrangements also put everyone at great risk. Players can be expelled, maybe lose scholarships; schools can be fined and have wins revoked. Tangerine Middle School has a much rougher reputation than Lake Windsor. Paul is nervous in the new surroundings, but handles himself well. After all, he’s had years of practice making himself invisible to bullies. He joins the soccer team as a back-up player and falls in quickly with his fellow teammates. He’s making friends and likes spending time with the Cruz family. Tino Cruz is one of the star players and his sister Theresa is the first person Paul met at his new school. Their older brother Luis operates their family’s citrus groves. Paul invites Tino, Theresa and some other students to his home to work on a science project. When Erik and Arthur (his side-kick and partner in crime, literally) arrive they immediately begin taunting Paul’s friends. Paul tries to brush it off but Tino won’t have it; he stands up to Erik and defends himself. Then Erik strikes him—hard and in the face. Paul’s friends immediately pack up and leave. Paul is heartbroken and angry. And, for the first time in his life, he begins to realize he must stand up to Erik. Luis Cruz pays a visit to Lake Windsor High to confront Erik about the incident at the Fisher house. Luis approaches Erik and his friends, but before a conversation can begin, Arthur (doing Erik’s bidding) strikes him in the head with a metal club. Unbeknownst to those involved, Paul witnesses the encounter. As events unfold it becomes clear that Erik’s behaviors, having gone unchecked, have become increasingly dangerous. That blow to Luis’s head turns out to be fatal; Luis dies days later from a blood clot. Paul can no longer remain silent. He must confront his parents about Erik’s behaviors and he also must share what he’s witnessed with the authorities. Occasionally, after reading a book I’ve thought, “This is a great book, but the story/circumstances/characters are unlikely. Things like this rarely ever happen.” Then I remember that’s part of the reason that we read. Maybe readers don’t directly know anybody who has dealt with such circumstances, but such things do exist. Reading helps us understand that, and it allows us to explore possibilities and learn from things without having to directly experience them. Bullies are everywhere; children may face them in school, adults may face them at work. 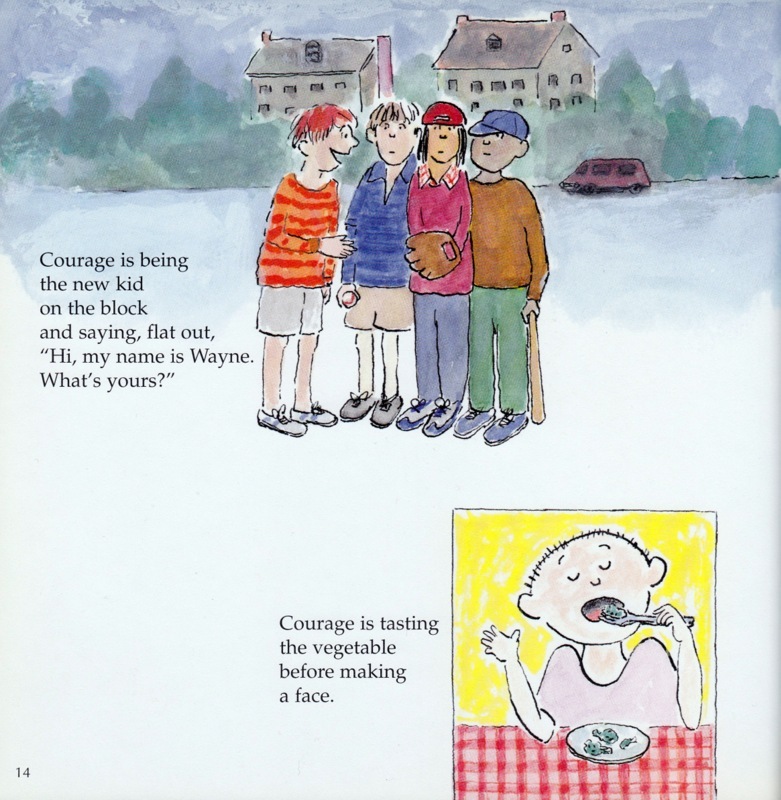 Finding courage and standing up for what’s right is the best way to overcome a bully. We cannot change the actions of others, but we can control how we react to those actions. 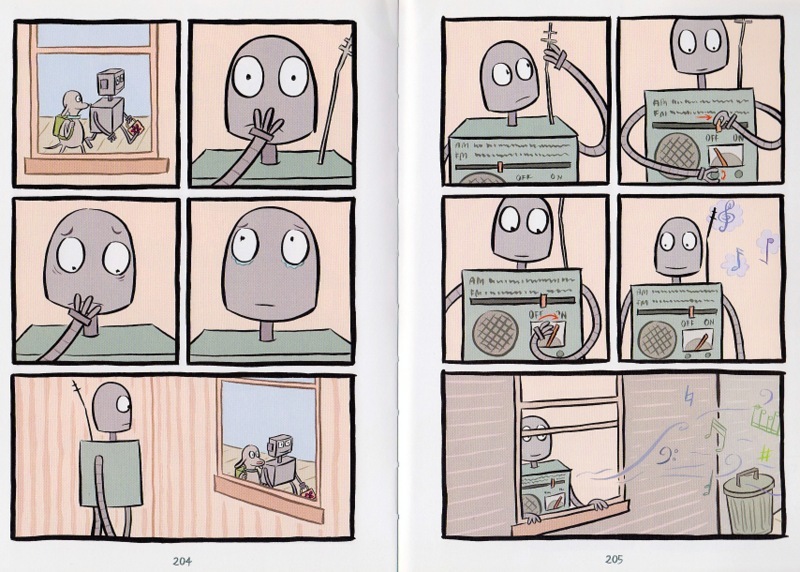 Robot Dreams: A funny, and sometimes heartbreaking, tale of friendship. Though I have categorized this book for ages seven and up, I happen to know at least one three year old who requests this book often. Because Robot Dreams is nearly wordless (and completely without dialogue), children and adults alike can create their own dialogue, their own narrative. The story takes place over the course of one year and is broken up by month, so parents reading to children can treat it as a chapter book and break it up over several sessions. Sharing a wordless book with a child can be an excellent opportunity to hear their perspective. How do they interpret the action in the art? How does that compare to what the adult sees? Every time a wordless book is opened a new story can be told, because there are no words to limit the narrator. A tale of friendships—some are fleeting, others long lasting—Robot Dreams is funny, and sometimes heart breaking. Varon’s characters are expressive and appealing. Her art is clean and uncluttered and her palette is muted yet colorful. The complete package makes for a charming and heartwarming book. This first page contains one panel; a dog is dropping an envelope into a mailbox. In the next spread a package is delivered and the, now happy, Dog begins assembling a robot. Robot seems to share Dog’s interests and the two become fast friends. Sadly, a trip to the beach proves tragic. Dog convinces Robot to play with him in the water, which causes Robot to seize up. The beach is closing and Dog must abandon his friend; Robot cannot move and Dog cannot carry him. The disheartened Dog walks off. As Robot lies on the beach, he dreams of his day with Dog. In the dream version, Robot passes on the swim and instead reads on the beach while Dog frolics in the waves. Back home Dog dreams of his friend alone on the beach. Dog goes to the library and checks out a robot repair manual. 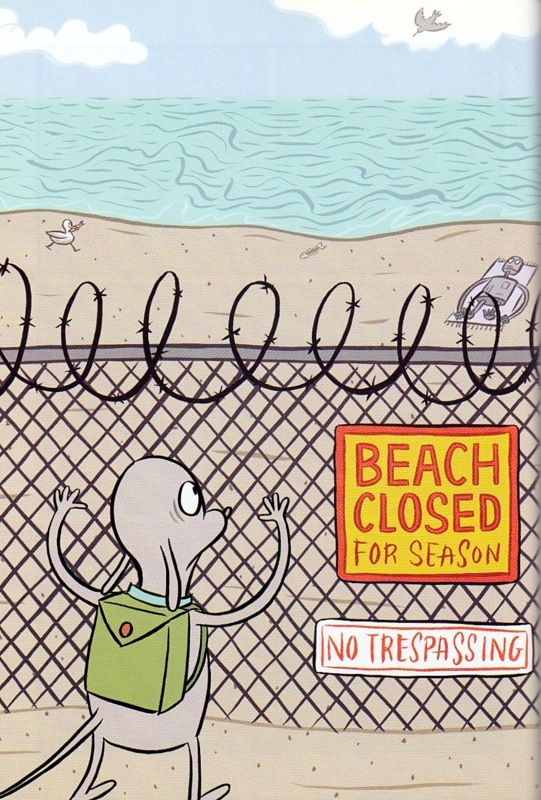 He then heads back to the beach to rescue his friend, but the beach is closed for the season. Despite the setbacks with Robot, Dog is determined to make new friends. While flying a kite in the park he meets a helpful duck. The two have some great times together but Duck and his family soon fly south for the winter, leaving Dog alone again. Then he befriends a pair of anteaters, but they clearly do not share the same interests. As winter arrives Dog decides to make a friend out of snow. Dog and Snowman enjoy some outdoor activities but Snowman doesn’t survive the warming spring temperatures. All the while, Dog thinks of his old friend Robot. Back on the beach, the dispirited Robot loses a leg to some seafaring bunnies needing to repair their boat. He has dreams of escaping the beach, only to find a happy Dog who has moved on without him. He dreams of being picked up by a seagull, and dropped onto a fluffy cloud, and riding a snowflake back down to the beach. Robot dreams of leaving the beach, of making new friends. Come spring, Robot is discovered by a beachcomber and is turned in for cash at scrap yard. A raccoon working to repair a radio purchases Robot’s remaining parts. Dog returns to the re-opened beach to rescue his old friend, but it’s too late. After much searching he finds only the part of Robot’s leg that was discarded by the bunnies. The dejected Dog decides to build another robot. This time things will be different. When the two friends head to the beach together, Dog prevents another tragedy by making sure his new friend remains on the sand. In the final few spreads Robot, now part radio, spots Dog outside walking with his new robot friend. Robot is happy in his new home but sentimental, or maybe sad, about seeing his former friend. He watches the happy pair walk on, raises his antennae, and turns on his radio to share his music. The final, single paneled page shows Dog happily whistling the tune that Robot has shared. Robot Dreams is an amazing tale of friendship and loss, of mistakes and regrets, and of letting go and moving on.